This is a large species of solitary bee with an early flight period in spring and early summer. It appears to have declined considerably in Ireland and is red-listed. A conspicuously hairy medium to large solitary bee. The thorax and the abdomen are covered in brown hairs. The brown hairs also extend down the hind legs. There is a patch of black hairs at the tip of the abdomen. The head is black and relatively hairless. Bees are insects which construct nests which they provision with honey and nectar. They are some of the most fascinating of insects and, because of their role in pollination, some of the most important. The best known bees are the social species – honey and bumblebees – but most are non-social, solitary species. Each female solitary bee constructs and provisions an individual nest. The nests of separate females may be built close together but there is no cooperation between them. There is also no worker caste in the solitary species, the work of building and provisioning the nest is done entirely by the female. Each nest typically will comprise a small number of cells provisioned with a mixture of nectar and pollen. The female lays a single egg per cell and the larva eats the stored food before pupating within the cell. A single female may construct several nests in her short lifetime, but she will not overlap with her offspring and the next generation. Male bees have only the single function of mating with a female. Nests of solitary species may be made directly in the ground or in a plant stem. Some species take over existing holes, for example the excavation of a wood boring beetle, whilst others create their own. The life cycle of this bee is typical of a solitary species. It is a ground-nesting species, females constructing their nest chambers in well-drained soil. The adults bees are present in the early spring from March to early June. There are 28 species solitary bee in the genus Andrena in Ireland. Identification of the individual species requires close examination and expert knowledge. This bee has been recorded from a variety of habitats including coastal undercliffs, dunes and other sandy places, parks and even large gardens. Areas of bare, well-drained soils close to flower-rich habitats should be searched for aggregations of nests. This is where the adults will be most active. Foraging bees will be seen on flowers but only in warm and sunny weather. The Irish range is mainly in the south and east. 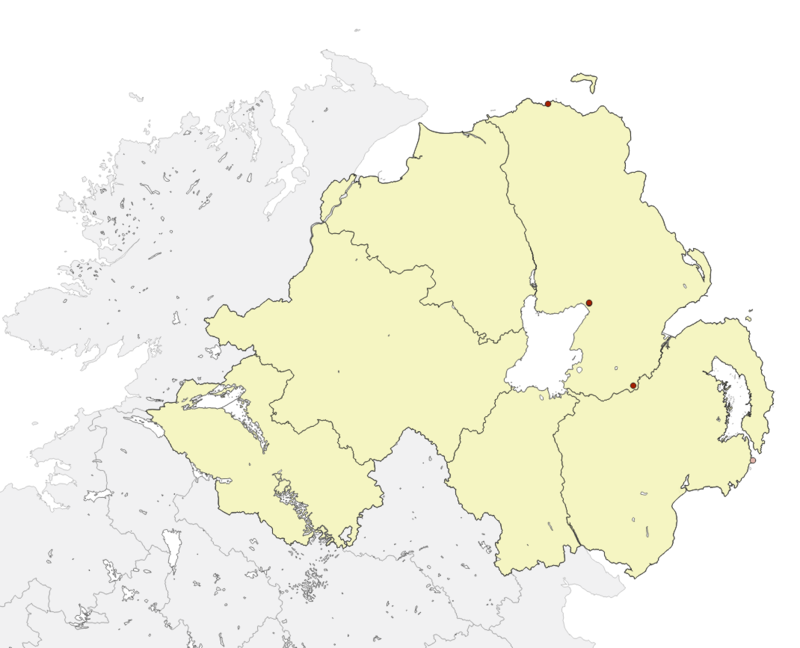 In Northern Ireland it is recorded from several sites in Cos Armagh and Down. The most recent records are from Rathlin Island in 2005. This is a rare and declining species of bee in Ireland. It was assessed as Vulnerable on the Irish bee red list. There have been few recent records and it has not been seen in many areas of Ireland where it previously occurred, including Northern Ireland. The reasons for the decline of this bee are unclear. It is not strictly tied to a particular habitat and it will forage from a variety of plants. The species has probably suffered like most bees from the loss of permanent flower-rich habitats. Discovering surviving populations of the bee is essential. There is also a need to gather Information on its habitat and ecology in Northern Ireland. This requires skilled observers and learning how to identify the species of Irish bee is a way you as an individual can make a valuable contribution. The decline of all species of bees should concern us as they are primary pollinators of many wild plants. Baldock, D. (2008). The Bees of Surrey. Surrey Wildlife Trust, Woking. Fitzpatrick Ú., Murray T.E., Byrne A., Paxton R.J. and Brown M.J.F. (2006). Regional Red List of Irish Bees, Report to National Parks and Wildlife Service (Ireland) and Environment and Heritage Service (N. Ireland).